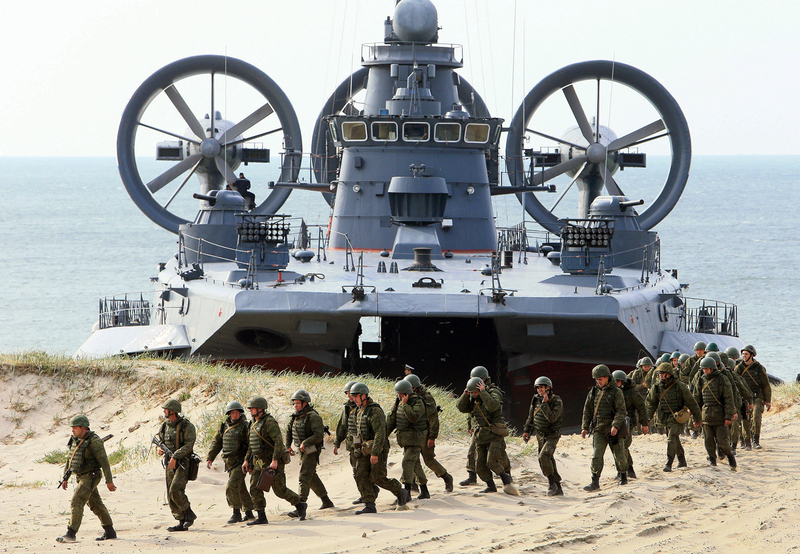 The air-cushion small landing ship Mordovia and servicemen of coastal defence troops at the Baltic Fleets's range during the joint Russian-Belarusian drills "Union Shield 2015" in Kaliningrad Region. Russian and Belarussian commanders will take into account NATO’s increased activity near the borders of the Russia-Belarus Union State when they develop the scenario of West-2017 joint drills, Russia’s Defense Minister Army General Sergei Shoigu said on Nov. 2. "When the goal and the scenario of the drills are developed, attention will be paid to the situation related to NATO’s increased activity near the borders of the Union State," Shoigu said, summing up the results of a joint board session of the Russian and Belarussian defense ministries. The strategic maneuvers will be held in September 2017 simultaneously on several training ranges of Russia and Belarus, he said. "We have approved the basic approaches to the preparation and the conduct of the joint strategic exercises West-2017. They will be the main event of the joint training of our armed forces in 2017," Shoigu said. According to the Russian defense minister, the drills will practice tasks for troops’ planning, command and control and use.